So instead of painstakingly growing phase lemons, I fed some common pink slime poop to the quantum slime. Pink slimes are the most basic type of slime; they are the only slime that eats "everything." 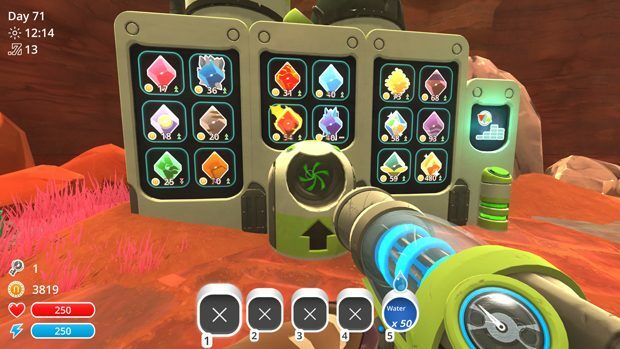 By merging quantum slimes with pink slimes, I had bred "pink quantum largo slimes" that could eat anything -- including carrots, perhaps the easiest and most plentiful crop to grow in Slime Rancher. The slimes' preferences were irrelevant; they would eat carrots and learn to like it, and in turn, I could then collect copious amounts of quantum poop, and sell it for $125 per lump! This is basically 50% of your time spent in Slime Rancher: instead of exploring the wilderness, you will probably stay on your ranch for several in-game days without any in-game sleep, constantly working and refining your huge factory farms and feedlots to maximize your profits. When you inevitably run out of space, you end up cramming these cute slimes into wretched conditions, 20-40 slimes to a small 5x5 meter lot -- it's easier to deal with them that way, and the game doesn't reward you for humane conditions or free-range livestock. The markets back on Earth don't care where their plorts come from! Games like Factorio embrace the dystopian dimension of industry, but I think Slime Rancher seems to have a bit of anxiety about the inevitable march of most players' ranches. 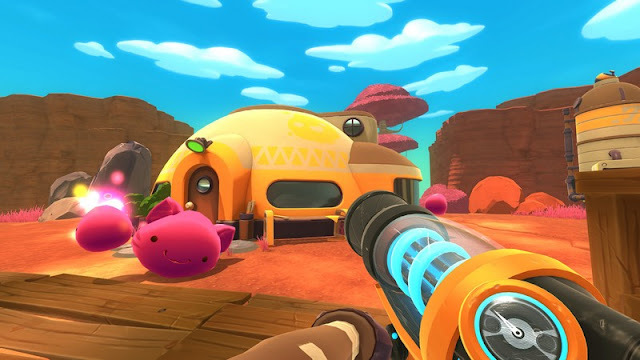 Each player-built nightmare wasteland of hyperindustrial agriculture runs counter to the authored game narrative of Slime Rancher: the menus and in-game letters suggest you are a spunky young woman taking over an abandoned ranch on an alien frontier planet, while you and your love interest of indeterminate gender pine for each other. As you explore the planet, you find messages from the previous ranch owner, who faced a similar dilemma between exploring the frontier or returning to a loved one. 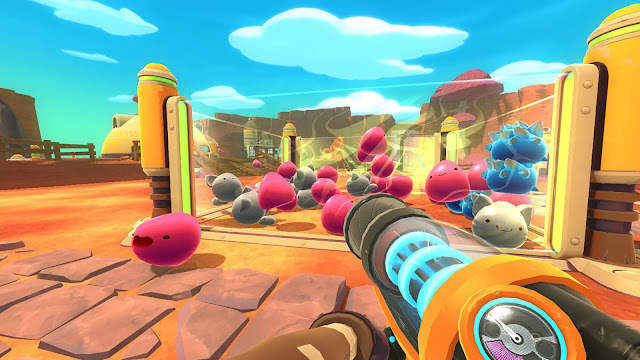 Taken all together, what is Slime Rancher about? It is about your (romantic) relationship with a place. The dynamic skybox and cloud rendering is gorgeous; peaceful guitar strumming music evokes a gentle prairie; and every adorable slime smiles at you, even the mean ones that want to eat you. It's nice and pleasant to be here, and by the end of your 10-20 hour run, you will know every nook and cranny of the game world. It's basically like Dark Souls. But unlike Dark Souls, which basically resents your memory and attempts to tame it, Slime Rancher quickly embraces your powers of colonialist gaze to efficiently transform the planet (and its inhabitants) into processed commodities for human use. What are the fastest routes for gathering resources, where are the most lucrative spawning areas? How should I arrange my crops and corrals and storage silos and resource extractors for the best daily routine, and efficiently sell my commodities to the markets back on Earth? These aren't particularly romantic concerns. So maybe Slime Rancher is precisely about how we try to wrap our land grabs with romance. Sure, you have a special someone back home on Earth -- but if they really loved you, then they would understand why you need to stay here and optimize your potato planting cycles. It is a lopsided love triangle driven by gentle compulsion to work the land; we seduce this land through our memory and labor.